Sigh, we all knew this was coming… Unfortunately in drama world, happy days don’t last for a long time. Things get really sad, and I’ve developed a deep sympathy and annoyance with Jin Xiu. We pick up from last episode. Zuo Zhen throws out a bunch of accusations about Long Si but he hasn’t proven anything yet with evidence. At this moment Shi Hao pops out from the coffin, 100% ok and unscathed – which is extremely suspicious, considering that he got shot between the chest/abdomen area. The drama justifies it by saying “Oh, Shi Hao was such a master gun-shooter, that he managed to manipulate the gun held in Ming Zhu’s hand to shoot him in a place that wouldn’t fatally wound him”. But… that chest-abdomen area would logically either puncture his lung (death), or get his liver directly under his lung (also death) since she shot him on the left side. Ok either way, even if he survives, he wouldn’t be jumping out of caskets so energetically ok?! He would be bedridden. So the way they did it, was to track down the guy in the police station that killed the police commissioner’s son, and keep him safe as a witness. The way they kept the witness safe, was to kill another man and burn him so when Long Si found the corpse, he would assume that it was the witness – which I was like, yo…. where did they find this man? And did he deserve to die?! Did you just end an innocent human life just to fulfill this scheme? Anyways this is all very illogical, even though the witness could still hired to lie, but even if he wasn’t, he could only prove that he killed the police commissioner’s son, and nothing else – he can’t prove anything about Boss Fung’s death. So there wasn’t actually that much evidence to prove Zuo Zhen’s innocence really, but drama. In other news, I finally figured out what meme Long Yi reminded me of. This guy, especially when the drama keeps putting a half shadow on his face. No seriously. They are identical. Long Si tries to run and escape, except that Long Yi had set a bomb outside (which is actually quite smart, because he could take out Long Si if Long Si squeals, or Zuo Zhen if he tries to run away). Long Si is blown to pieces, and Andy Lau (the Japanese teacher, but at this point I still don’t know his name) whips Long Yi in punishment for killing their only connection to the triad community in Shanghai. So now we can link Long Yi’s psychosis to its root: his crazy teacher. Jin Xiu coincidentally finds Long Yi on the bridge, waving around the locket. She realizes that she saw him at Saint Mary’s Cathedral that day. This, at the same time, makes Long Yi realize that Jin Xiu is the daughter that he’s been looking for from the Rong family, which he was responsible for the murders. 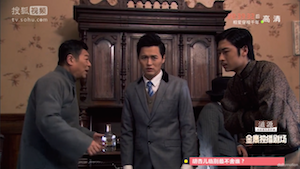 Long Yi tries to separate Zuo Zhen and Jin Xiu by buying of Jiu Shu (Uncle Nine LOL). 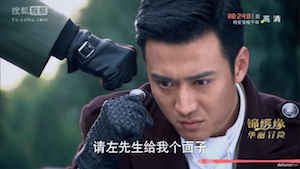 Uncle Nine reveals that Zuo Zhen was the man that killed her whole family over packets of medicine, and that’s the reason why Jiu Shu was so afraid of Zuo Zhen that he’d jump over a cliff. Jiu Shu only says this because Long Yi had bribed him. And I must say that is either the crappiest cliff ever when two men have survived falling over the ledge – or Jin Xiu is really bad at checking for survivors and rescuing people. Jin Xiu starts to believe that Zuo Zhen killed her family. I actually really don’t blame her. Zuo Zhen has proven himself to be a person to kill and take lives for his own agenda. I mean look at that guy earlier that he killed – he killed a man just for the corpse, so he could use that corpse to cover up for his witness. Zuo Zhen obviously does not value the human life, and for him, the end justifies the means. So would he kill an entire family for a packet of medicine? That’s actually pretty believable. Jin Xiu isn’t doubting whether he loves her or not, since she knows that he fell in love with her after he met her in Shanghai, completely unrelated to her parents. She goes to him and asks him very vague questions – which I also don’t blame her for. When you believe someone’s been lying to you all along, why would you think that they would suddenly tell the truth when you confront them? Still, Jin Xiu takes it with a grain of salt. Zuo Zhen notices that there is something wrong with Jin Xiu’s behaviour, so he decided to investigate all the people that she interacted with, which he found Jiu Shu. 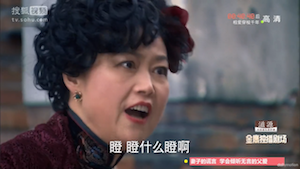 Unfortunately, Jiu Shu was poisoned earlier on that day by Long Yi (to keep the bribe a secret). Jiu Shu coincidentally dies while Zuo Zhen is confronting him, and this is also coincidentally witnessed by Jin Xiu. 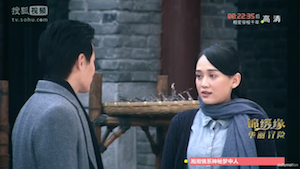 Jin Xiu proceeds to ask Zuo Zhen evasive and passive questions about the murders again, and Zuo Zhen, not knowing what was going on, admitted that it was within his character to do anything for a goal. Jin Xiu took that as a confession. Her actions escalate quickly as she freaking decides to murder him in his sleep. Ok I understood why she asked evasive questions but c’mon, to kill him without getting a straight answer is actually so unbelievably dumb. You didn’t even hear the words out of his mouth, and you’re assuming! Now you decide to stab him while he’s asleep?! By the time Zuo Zhen wakes up, Jin Xiu is gone, because she couldn’t bear to do it. Since she’s missing, he got all his men to look for her (hence, the look of determination in our top right picture). Jin Xiu roams the streets of Shanghai late at night, and she makes this police officer angry by confronting him about hurting a child. This was such a sad and disturbing scene because he kept kicking her stomach even though she was bleeding down her legs. I was so sad :'(. He wasn’t sent by anyone, he was just a very aggressive and mean cop who decided to pick on a pregnant lady. Jin Xiu gets ‘saved’ by a woman who nursed her back to health, but really wanted to sell her to a brothel. Jin Xiu didn’t put up much a fight in getting sold because she was so upset about the death of her child. 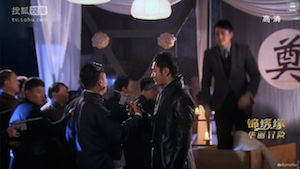 Jin Xiu lucks out and gets a good rich guy in her first ‘encounter’ as a prostitute. This is so cliche – she’s met four good rich guys so far in Shanghai (in the time period of a few years) and I have never met one in all the years of my life. What are the chances?! She’s about to kill herself when this rich good guy, Wang Shao, steps in and convinces to live. Meanwhile, Long Yi is also looking for Jin Xiu. He’s very upset that she’s missing. His teacher finds out that she is alive, and tells him that the only way that he can make up for it is to transfer all the gold (from the racetrack land) out of Shanghai. 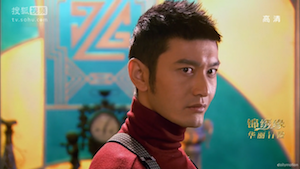 Long Yi nearly fails at transporting the gold out and gets into a fight with Zuo Zhen, until his teacher and the French ambassador show up, and pressures Zuo Zhen to allow the shipments to go out. 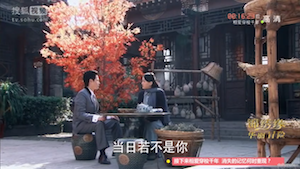 Wang Shao professes his love to Jin Xiu (oh how typical and cliche) but she declines. He offers to take care of her as a brother. 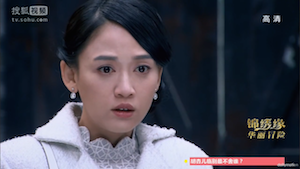 Ming Zhu finds out that she’s pregnant, and the conception date aligns with the dates that she got raped by both Long Yi and Boss Shum. She’s devastated of course, and I feel so bad for her misfortunes and her addiction to opium. I felt like if only she had opened up early on to Xiang Han Chuan, she wouldn’t be in this predicament right now. The episode ends with her about to take some abortion medicine. The plot is moving so fast right now (which is good). Jin Xiu’s going to meet up with Ying Dong in the next episode. Can’t believe Cruel Romance ends next week!!! 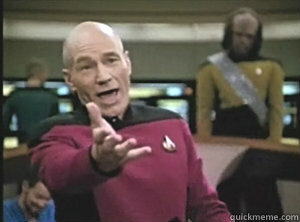 OMG, your recaps are so funny! I started watching this week and can’t agree more with you on the flaws of the plots and characters. 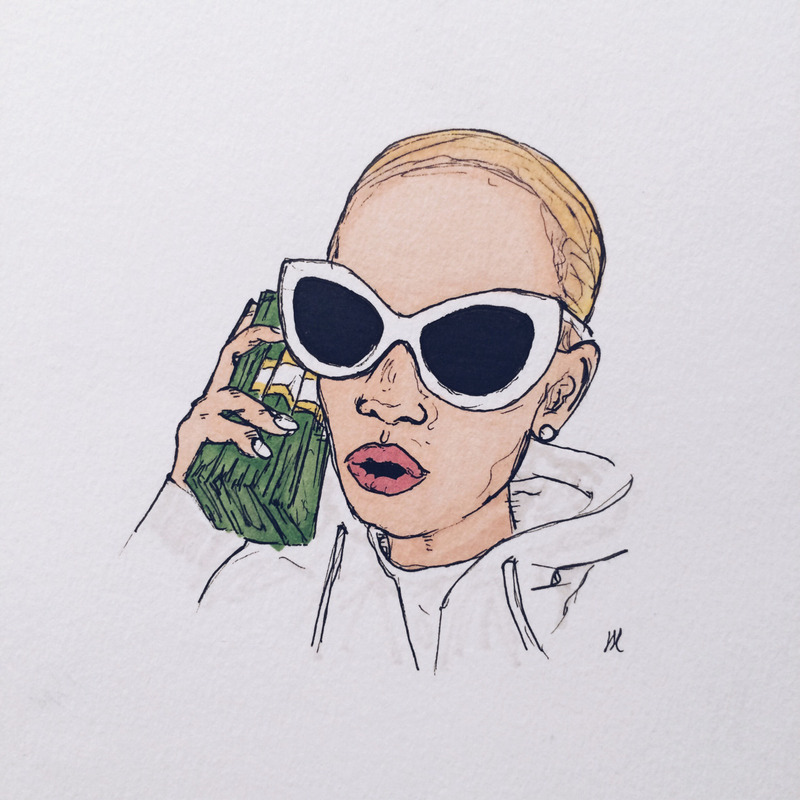 The drama is cliche but I keep watching it, I can’t stop til I finish. 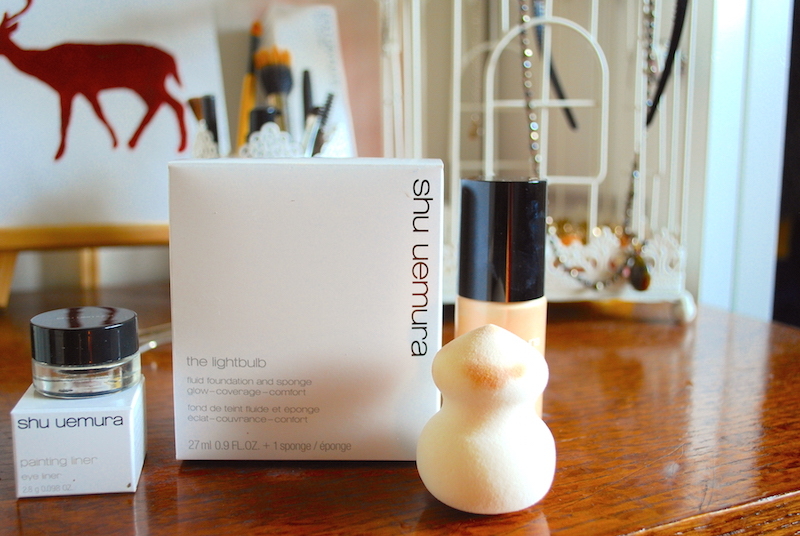 Thanks for your recaps, I’m going to start following your posts! Omg I’m so sorry to hear that… and it was so graphic too… today they find out the truth… turns out they’re ending the drama at episode 40instead of 44.. no wonder its cut and edited so weirdly! Oh cool, it’ll be finished before I go on holiday. No wonder the drama seems to be moving so fast now. Wow Long Yi is going crazy, I don’t think he is very focused on his mission anymore. Think he just wants JX. Did he kill his teacher? Hence the guy laying on the floor? Seems to be only conclusion on how teacher was stopped when attempting to assassinate JX.